NASA's Solar Probe Plus – the first mission that will fly into sun's upper atmosphere and “touch” the sun – has passed a design review, an important milestone leading to its anticipated summer 2018 launch. The successful review means the mission may now transition from formulation and design to final assembly and implementation. The spacecraft, as it appears in the image, currently includes the primary structure and propulsion system. Over the next phase of the mission, engineers at the Johns Hopkins Applied Physics Laboratory in Laurel, Maryland – which manages the mission and is building the spacecraft – will finish assembly and install the rest of the spacecraft systems and science instruments. Solar Probe Plus is slated to launch during a 20-day window that opens July 31, 2018. The spacecraft will collect data on the mechanisms that heat the corona and accelerate the solar wind, a constant flow of charged particles from the sun. These are two processes with fundamental roles in the complex interconnected system linking the sun and near-Earth space – a system that can drive changes in our space weather and impact our satellites. Solar Probe Plus is part of NASA’s Living With a Star program, an initiative focused on aspects of the sun-Earth system that directly affect human lives and society. The program is managed by NASA’s Goddard Spaceflight Center in Greenbelt, Maryland. 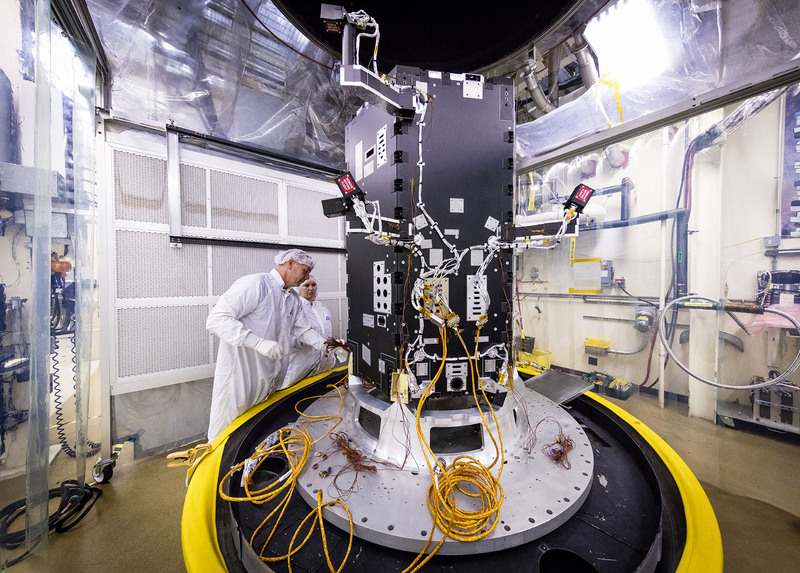 Engineers at the Johns Hopkins University Applied Physics Laboratory in Laurel, Maryland, prepare the developing Solar Probe Plus spacecraft for thermal vacuum tests that simulate conditions in space. Today the spacecraft includes the primary structure and its propulsion system; still to be installed over the next several months are critical systems such as power, communications and thermal protection, as well as science instruments.